Disclaimer: Many of the features presented here are rather new and can not be found in the open-source version of Virtuoso. Virtuoso is actually a quadruple-store which means each triple lives in a named graph. In Virtuoso named graphs can be public or private (in reality it is a bit more complex than that but this view on things is sufficient for our purposes), public graphs being readable and writable by anyone who has permission to read or write in general, private graphs only being readable and writable by administrators and those to which named graph permissions have been granted. The latter case is what interests us today. But now we want to share the contents of this named graph with someone. Like before we will use my LinkedIn account. This time, however, we will not use a UI but Virtuoso’s RESTful ACL API to create the necessary rules for sharing the named graph. The API uses Turtle as its main input format. Thus, we will describe the ACL rule used to share the contents of the named graph as follows. Virtuoso makes use of the ACL ontology proposed by the W3C and extends on it with several custom classes and properties in the OpenLink ACL Ontology. Most of this little Turtle snippet should be obvious: we create an Authorization resource which grants Read access to urn:trueg:demo for agent http://www.linkedin.com/in/trueg. The only tricky part is the scope. Virtuoso has the concept of ACL scopes which group rules by their resource type. In this case the scope is private graphs, another typical scope would be DAV resources. As a result we get the full rule resource including additional properties added by the API. We see all the original triples in the private graph. And as before with DAV resources no local account is necessary to get access to named graphs. Of course we can also grant write access, use groups, etc.. But those are topics for another day. oplacl:DefaultRealm oplacl:hasDisabledAclScope oplacl:Query , oplacl:PrivateGraphs . oplacl:DefaultRealm oplacl:hasEnabledAclScope oplacl:Query , oplacl:PrivateGraphs . I will explain these technical concepts in more detail in another article. thanks for this and other posts they are very helpful! In a java server application I want to access the entry point on behalf of the user logged in via our client web app, is there some way to use Virtuoso ACL only providing the user URI? That is, as a java server, I’d like to get all the graphs a user of mine can read. yes, that can be achieved by manually activating the ACLs. 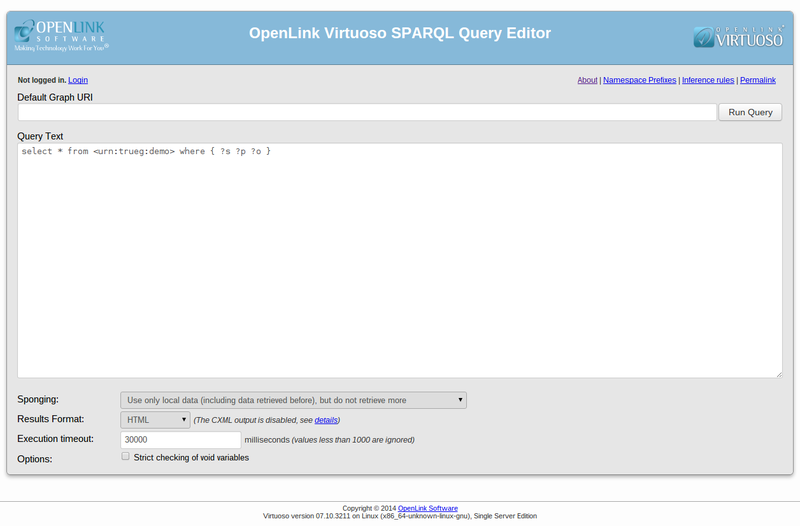 However, the sparql endpoint does not allow that atm as it creates the prefix mentioned below itself. 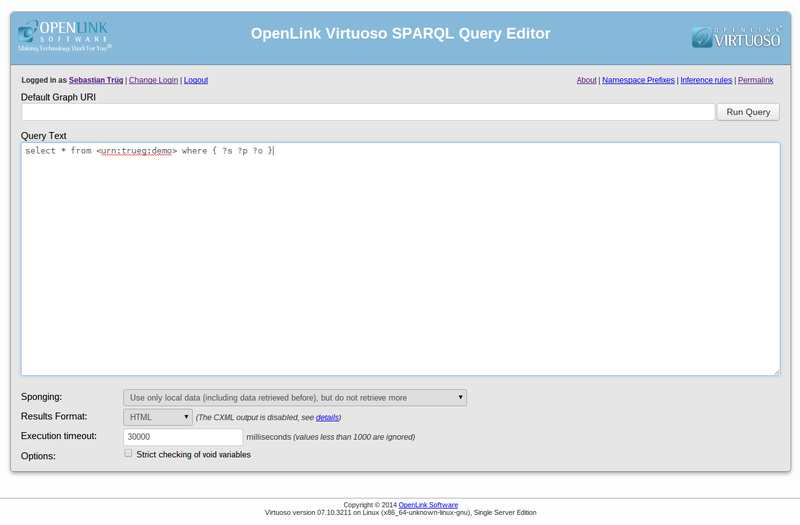 You could, however, connect to Virtuoso via JDBC and then enforce ACLs using the sparql extensions we put in place. You could connect as “dba” but I recommend a user which has the SPARQL_UPDATE role and default access to all graphs according to the “classical” graph security in Virtuoso. define sql:gs-app-callback "VAL_SPARQL_PERMS" define sql:gs-app-uid "urn:me"
Hi Sebastian, regarding your reply i’m wondering if the *urn:me* URI identifies a Virtuoso user. I mean the java server application stores the users in Virtuoso triple store as type foaf:Person, but does not create the user by using DB.DBA.USER_CREATE procedure. Will, your example still work? urn:me is merely an example which is unrelated to any Virtuoso account. The ACL system I present here is independent of Virtuoso users. Thus, if you define ACLs, granting urn:me access to certain graphs, then the prefix I presented will take those into account. There is no Virtuoso user, other than the one you use for JDBC access, involved. OK, thanks a lot for your reply. You’ve clarified all my doubts. Last but not least this example should work even for Virtuoso open source right? In your example you connect via Linkedin account to Virtuoso. (This operation is done by using a particular module for Virtuoso i think) and then you try to query the graph. 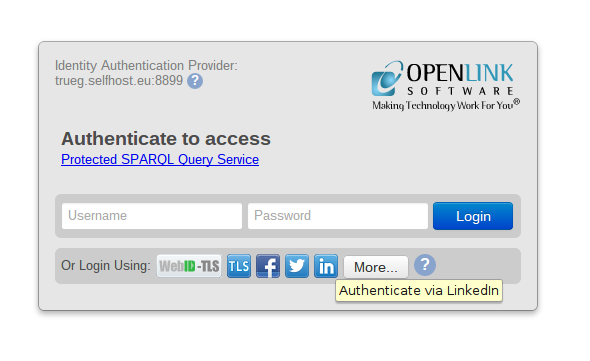 When I log into the sparql endpoint with my LinkedIn identity there is no Virtuoso user account involved (there might be a connected one but that is out-of-scope here). That means Virtuoso simply identifies me via my LinkedIn URI which is https://www.linkedin.com/in/trueg. 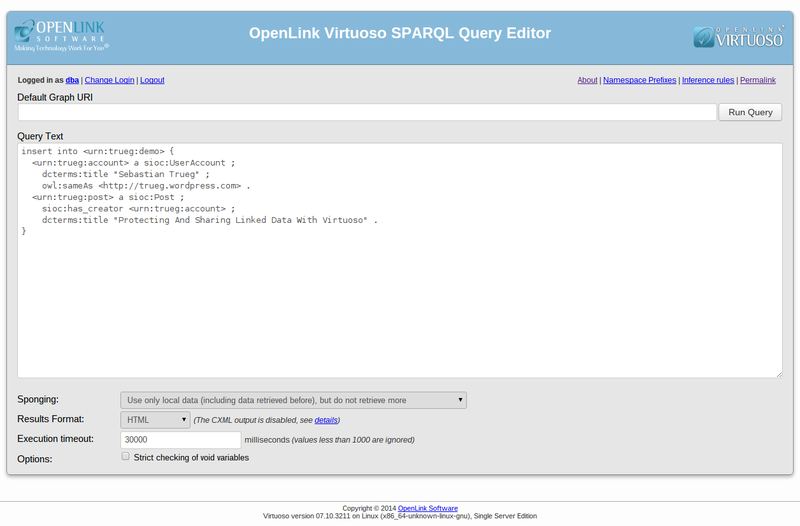 define sql:gs-app-callback “VAL_SPARQL_PERMS” define sql:gs-app-uid “https://www.linkedin.com/in/trueg"
Sorry, the ACL engine is restricted to Virtuoso closed source at this point. I understand you work for Openlink and on these very stuff, so you surely know the matter better than I do, but are you sure the ACL engine is not also included in the OS version of Virtuoso 7? Virtuoso closed-source only supports the “old” ACL system which allows to define rules mapping certain WebIDs to a Virtuoso SQL user. 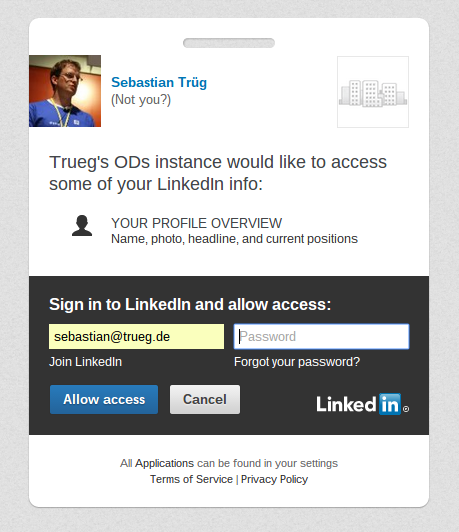 This SQL user in turn can have access to certain graphs using role-based security. Virtuoso 7 closed source has the new ACL system I presented in my blog entries.